This auction is for a WELBILT GOLDEN SOUNDS COLLECTORS RADIO MODEL 1933 CR AM/FM CASSETTE RADIO used as an on-screen prop for UNBOUND. 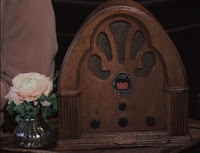 This radio is a replica of the old-fashioned “cathedral” radios popularized by companies like Philco in the early days of radio. The Producers have chosen to benefit Memorial Sloan-Kettering Cancer Center in New York City with the auction proceeds. Learn more and bid now on eBay.